LAKEVILLE, IN. 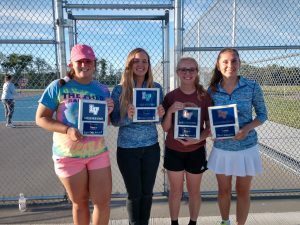 – The LaVille Girl’s tennis team celebrated awards recognition night. “We started our season with really good momentum,” said LaVille coach Melissa Haisley. “Our practices were very productive, and we started out 3-0. Our schedule became tougher and we slid into a bit of a losing streak, but we stayed competitive. In those matches we lost during that time, it definitely could have went either way, so we would have preferred to have won, but we’re happy with the way the girls played. We came back and won a few more matches and had a good showing at the Concord Invitational. The Lancers finished 6-8 overall and 2-4 in the Hoosier North Athletic Conference. LaVille also finished in third place in the HNAC Championships.